Carrizo Plain National Monument is one of the largest remaining patches of San Joaquin Desert left within the Central Valley of California. It is home to many threatened and endangered species including the San Joaquin kit fox, blunt-nosed leopard lizard, and giant kangaroo rat. The dominant plant lifeform is shrubs. The species Ephedra californica comprises a major proportion of the community within this region and likely also provides key ecosystem services. We used motion sensor trail cameras to examine interactions between animals and these shrubs. This technology is a less invasive alternative to other animal surveying methods such as line transects, radio tracking, and spotlight surveys. Cameras were placed within the shrub understory and in the open (i.e. non-canopied) microhabitats at ground level to estimate animal activity. Trail cameras were successful in detecting the presence of animal species at shruband open microhabitats. A total of 20 cameras were deployed from April 1st, 2015 to July 5th, 2015 at paired shrub/open microsites at three locations along Elkhorn Road in Carrizo Plain National Monument (35.1914 N, 119.7929 W). Each independent site was approximately 1 square kilometer. Over 420,000 pictures (both of animals and triggers from vegetation moving in the wind) were taken during this time. 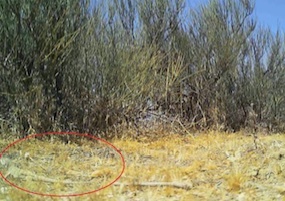 The trigger rate was very high on the medium sensitivity camera setting in this desert ecosystem, and the rates did not differ between shrub and open microsites. We reviewed 100,000 of the images for content before uploading them to GigaDB to ensure image quality, presence of animals, date and temperature stamp, and data integrity. It was found that some of the cameras had not had the date set correctly, users are advised to only use the dates as listed in the sampling metadata table as provided in GigaDB. ... Description:Site 1 is a subsection of site 2. It is the northernmost site on Elkhorn Road used in this survey. The main shrub found at this site is Ephedra californica. ... Description:Site 2 is the northernmost site on Elkhorn Road used in this survey. The main shrub found at this site is Ephedra californica. ... Description:Site 5 is the centrally located site on Elkhorn Road used in this survey. The main shrub found at this site is Ephedra californica. ... Description:Site 7 is the southernmost site on Elkhorn Road used in this survey. The main shrub found at this site is Ephedra californica. Displaying 1-10 of 470 File(s). October 3, 2016 Description updated from : Carrizo Plain National Monument is one of the largest remaining patches of San Joaquin Desert left within the Central Valley of California. It is home to many threatened and endangered species including the San Joaquin kit fox, blunt-nosed leopard lizard, and giant kangaroo rat. The dominant plant lifeform is shrubs. The species Ephedra californica comprises a major proportion of the community within this region and likely also provides key ecosystem services. We used motion sensor trail cameras to examine interactions between animals and these shrubs. This technology is a less invasive alternative to other animal surveying methods such as line transects, radio tracking, and spotlight surveys. Cameras were placed within the shrub understory and in the open (i.e. non-canopied) microhabitats at ground level to estimate animal activity.